General Awareness Questions for IBPS PO Mains- IBPS PO Mains is just 4 days away and we predict that students must be well prepared for the exam. Considering surprises in IBPS PO Prelims this year, some changes are also expected in IBPS PO Mains pattern 2017. Students must be mentally prepared to deal with any pattern change in a calm manner and give their best. If a candidate is prepared as per IBPS PO syllabus, he/she can perform well in the exam. IBPS PO mains exam date is 26th November 2017. Students should verify the details of exam venue and details from IBPS PO mains admit card 2017. ]In the last few days of preparation, students are searching for GK questions and answers asked in IBPS PO mains. 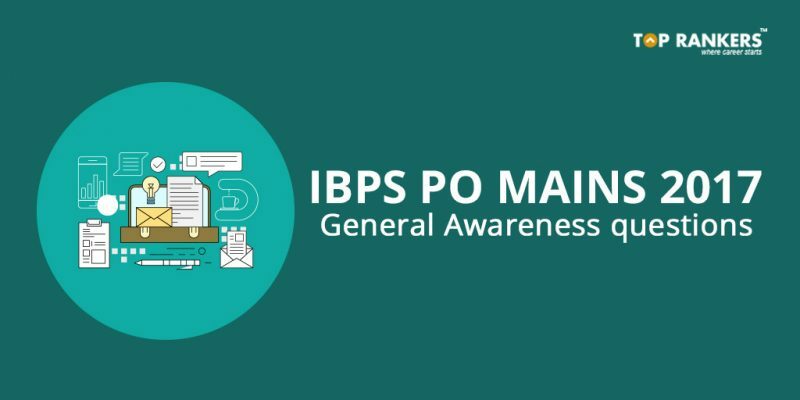 To help you with IBPS PO mains general awareness preparation, we bring you General Awareness Questions for IBPS PO Mains- an article which features questions from domains like banking, sports, national & international affairs, sports, entertainment, banking and finance, economics, polity, etc. If you haven’t downloaded your IBPS PO mains admit card yet, download it from IBPS official website. Make sure you attempt general awareness quiz for IBPS PO mains to enhance your preparation! Q. Name the Indian origin campaigner who was named UK’s most influential black person of the year. Q. According to the Credit Suisse report, what is the ranking of India in the family-owned businesses across the country? Q. Up to what percent State Bank of India has slashed Immediate Payment Service (IMPS) charges? Q. World Day for Audiovisual Heritage is observed globally on ___________. Q. The travel guide company Lonely Planet has ranked ___________ as the number one country to visit in 2018 in its Best in Travel 2018 list. Q. Name the Gulf country that has committed for the first time that it will introduce a minimum wage for workers in the country. Q. With the Tourism Promotion Board of which country, GMR Hyderabad International Airport Ltd (GHIAL) has signed the MoU to promote tourism? Q. Which of the following country has become the first country in the world to give citizenship to a robot? Q. Rabindranath Tagore is also known as? Q. Indira Gandhi Centre for Atomic Research has established in 1971, is located at? Q. In October 2017, Cricket Association of which among the following state/UT was chosen by the Committee of Administrators (CoA) as an associate member of the Board of Control for Cricket in India (BCCI)? Q. Which country will host the 2019 FIFA Women’s World Cup? Q. Who among the following has won the UN High Commission for Refugees (UNHCR) Award 2017? Q. Which Country hosted the first BIMSTEC Disaster Management Exercise? Q. The 30th edition of CORPAT exercise was recently held between Indian and Indonesian Navy. CORPAT stands for ? Q. Who is the Chairman of the Telecom Regulatory Authority of India (TRAI)? Was this post on General Awareness Questions for IBPS PO Mains helpful? If yes, do visit us again for more updates like this.